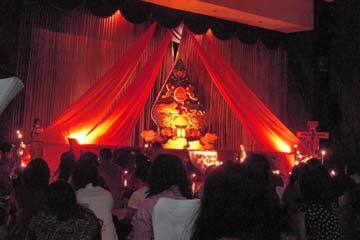 During the month of May 2011, some brothers of Taizé spent three weeks in Indonesia. For some years now, young people from the region of Bandung on the island of Java in Indonesia have been coming for a stay at Taizé. This is for them a very intense time, marked by prayer and by communion with people of different origins. The time they spend at these meetings also supports their commitment to the pastoral care of young people, once they are back home. The songs of Taizé and the experiences lived there accompany them, when life continues and when families break down. We were able to note this during an afternoon at Bandung, in an Ursuline sisters’ house. One of the sisters had invited all those who had been to Taizé over the last few years, together with their families. The songs of Taizé were also known by the children! Some of them sang the solos and accompanied the songs on their instruments. It was not perfect, but everyone took part enthusiastically. Certainly the children sensed that they could make use of their gifts in this way, even with very simple means. In a few years’ time, they will form part of the groups of young people in the parishes, just as their parents did in the past. “We must not forget the next generation” said the sister, aged over 80, who had organised it all and invited people to the prayer. “If we bring the children along gently, things will continue.” Then: “Come back soon, to see us in Bandung.” Bandung – a few hours by train from Jakarta – is one of the towns that we have visited. But it was in the capital of the fourth largest country in the world that our visit began. Some young people of Jakarta, who are involved in pastoral care, were happy to welcome us in their homes, to share their daily life with us, and to show us how they are continuing to live the experiences they had at Taizé. We went to a training centre for evangelical churches and met there with men and women pastors for a meeting and a prayer in the centre’s chapel. One young person, who was at Taizé recently, now works there. 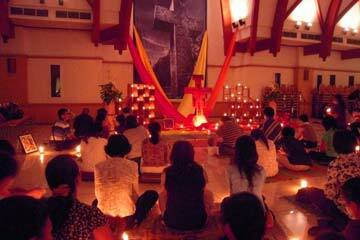 A young woman pastor of the GKI Surya Utama – a reformed church of Indonesia – had been to Taizé whilst a student. She invited us to evening prayer with her community. Another afternoon, we met an ecumenical group of young people from different parishes and communities, at the Santa Ursula school, to share about the ‘Letter from Chile’ and to reflect about how to lead common prayer. An evening prayer, open to others, seemed the natural conclusion to this. Yogyakartya was the third city that we visited. It reflected, through the diversity of the students coming from different islands, the colourful variety of cultures and traditions of this country. 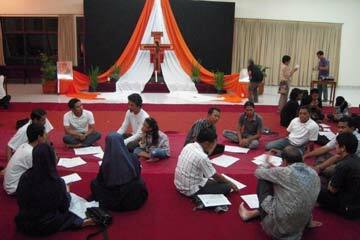 This was palpable during two prayers held at Christian universities: the first evening in the Catholic Sanata Dharma University, the second in the Duta Wacana University, jointly founded by eleven reformed churches. The two evenings began with a bible introduction and sharing in small groups. Some young people and a priest told of their involvement during the eruption of the Merapi volcano. Confronted with the exodus of many seeking refuge from the advancing torrents of lava, they established provisional places to stay in the seminary, open to all, including Muslim neighbours. A sign of hope and sharing in a country where differences are sometimes more important than what unites. There were still more meetings on the island of Java, like that at Surabaya – a prayer for the young people of the town at the Santa Maria church, and participation in the weekly prayer at an evangelical church – and, at Semarang, where a prayer, open to all, is held regularly at the seminary. Indonesia possesses a marvellous diversity, with its 17,000 islands and over 300 languages. During our short visit, we were able to explore this a little… But in this diversity we sensed, again and again, how faith unites us, beyond our differences of language, culture, country, continent – or Christian denomination. One of the brothers describes a short visit he made to Indonesia in 2010. Two weeks after the Pilgrimage of trust meeting in Manila, I went to Indonesia. While I was in Jakarta, I was able to take part in the monthly prayer at the Parish of St. Theresa. Successive generations of young people in the parish have been organizing this prayer for many years. Some of them had been in Manila to take part of the Pilgrimage of trust. Around 50 people came to the prayer; not only members of the parish but also young people who know that a prayer with songs from Taizé is held there every month. When the prayer was over, those who had taken part in the Manila meeting shared their experiences with the others who had not been able to go. Some of them had had a chance to participate in a similar meeting some years ago, when Brother Alois came to Jogjakarta for a weekend meeting. So in their minds, they thought that their stay in the families would be more less the same like in Yogyakarta. In fact, it was quite different. They had to commute everyday from the parish where they were staying to the main venue in Don Bosco Makati. At the beginning they had difficulty in understanding the transportation system and to remember the names and places where they had to get down. Later they got used to it and above all they got know the other pilgrims who were staying in the same parish. 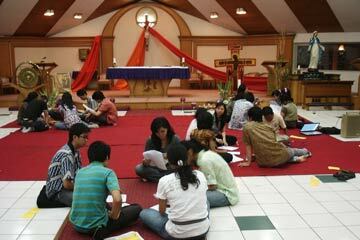 I took part in another payer in Jakarta, at the Catholic University, Universitas Katolik Atma Jaya. Some of the students from this university have been in Taizé in recent years. This was the third time one of the brothers of the community visited their university. The prayer was organized by the campus ministry. Afterwards, the students read together the “Letter from China”; then they spent around 30 minutes in silence and then continued in small groups. In the small town of Tegal, in Central Java, prayer with songs from Taizé is held in TORSA (Tahun Orientasi Rohani Santo Agustinus) once a month. Not many people of the town know about the prayer in Sacred Heart of Jesus Parish. The idea of having a weekend gathering came up quite spontaneously. Some people even came from as far away as Bandung and Jakarta! 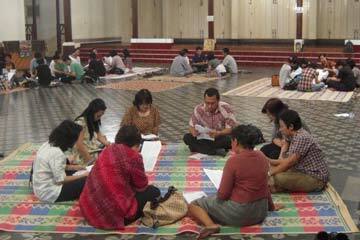 Those who came from outside Tegal were accommodated in families, in TORSA and in the parish house. For one of the evening prayers, over 80 young people took part. Many of them had never experienced this kind of prayer and silence before. The next day, after morning prayer, a short Bible introduction and a moment of silence, there was a long sharing in small groups: What gives me direction in my life? Are there things in myself which I want to change? What does the word “thirst” evoke for me? With what other words would I describe my search for God? What does “life in fullness” mean for me? “A thirst for life in fullness”: do I experience this thirst? How is this thirst quenched? Just before the celebration of the Eucharist that concluded the weekend, someone read the letter from Richard, from Haiti, who asked everyone to pray for Haiti on the 12th of each month; the 12th of January was the date that the earthquake struck.